Ignited! by Vince Thompson: Ignited Contributor, Keith Rosen, with his own book and Special Offer! If you've had a chance to read Ignited you know that I'm a big fan of Keith Rosen. Back in 2002 when I was building AOL's sales training organization I found Keith with a simple Internet search. His site was nothing special but his words certainly were. It was clear to me that Keith really knew how to create value and grow relationships. Later as we did the research for Ignited we found ourselves leaning on Keith for expertise related to coaching. The stories and advice he shared have become favorites of Ignited's readers. Well it is no surpise that Keith's career just keeps rocketing skyward. His websites is now great, he's a sought after speaker and his books on selling are teaching us all about the new ways of selling. Today...he's hours away from kicking off his newest work with a special offer and excerpt for us! Technology has not only changed the way companies sell but the way managers build and develop their team. Even with the right knowledge and resources, they’re usually too bogged down in daily challenges, deadlines, and personal responsibilities to get it all done. As a result, advancing their people takes a back seat to more immediate problems, keeping teams mired in mediocrity. With a savvy, younger generation to manage and fewer resources to do so, managers have less face time with their staff. As more companies transition to a virtual team environment, it's essential for managers to learn how to quickly and efficiently coach, develop, motivate and retain their top performers at a distance; over the telephone and via the internet. The fact is, regardless of experience, most leadership efforts are doomed from the start. Managers lose talented people and maintain an atmosphere of mediocrity not because of a lack of effort but because they lack the coaching acumen and skill set as well as a defined coaching system to leverage each person's strengths and abilities in order to generate consistent, worthwhile results. If you're responsible for coaching or managing anyone, best selling author Keith Rosen will help you make the transition from manager to coach by developing the missing discipline of leadership - executive sales coaching. Most managers have never been trained to manage, let alone coach effectively. In his new book, Coaching Salespeople into Sales Champions, Keith delivers a tactical coaching system for managers, business owners, coaches and executives - anyone who wants a proven and powerful method to coach and develop true champions. Plenty of programs espouse new management and leadership theories for managers, but few show you how to actually coach your people on a daily basis in a way that creates measurable change. Now, you can implement a systematic approach to develop a world class team and achieve the meaningful, long lasting results you want-today. • Motivate their team through the Art of Enrollment™, the new language of leadership. • Empower their people to solve their own problems and become fully accountable using the L.E.A.D.S. Coaching System™ - rather than being dependent on you. • Handle difficult people without conflict and determine when to let them go without collateral damage. • Leverage your personal strengths as well as the hidden talents of your team. • Eliminate hours of your daily workload so you can focus on the activities that yield the greatest ROI. • Transition from manager to coach. • Make the shift from a corporate culture to a coaching culture. 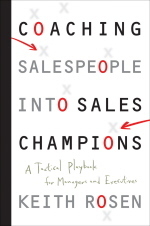 Purchase Coaching Salespeople into Sales Champions by April 17 and enjoy access to hundreds of dollars worth of additional materials from Dr. Tony Alessandra, Zig Ziglar, Tom Hopkins, Jim Cathcart, Jill Konrath, Dave Lakhani, Bob Kantin, Dr. Rick Kirschner, CanDoGo.com, AllBusiness.com, SalesDog.com and more. You can spend hundreds of dollars separately or you can invest about $20.00, order one copy of Keith's book today and spend not one penny more. Look at the resources you get here. Plenty of books espouse new management and leadership theories for managers, but few show you how to actually coach your people on a daily basis in a way that creates measurable change. Coaching Salespeople into Sales Champions provides a proven methodology and tactical strategy for coaching that bridges the gap between theory and execution so that you can achieve unprecedented results -today. Get Keith's book 37% off and hundreds of dollars worth of additional materials here. Special Excerpt, The Art of Enrollment, for Ignited Managers right here. No one else is more worthy of our deep-felt reverence and gratitude. Blessings to you! atmosphere of mediocrity not because of a lack of effort but because they lack the coaching acumen and skill set as well as a defined coaching system to leverage each person's strengths and abilities in order to generate consistent, worthwhile results.